In a departure from the normal routine, Bulls coach Tom Thibodeau conducted the team’s game day shootaround on Friday at the United Center rather the Berto Center. Rose’s Bulls will try to maintain their perfect record in the preseason when they host the Indiana Pacers on Friday night (7 p.m. CT | CSN & NBA TV | ESPN 1000). This past summer, the team broke ground on a new 60,000-square-feet practice facility which will be located directly east of the United Center. The state-of-the-art facility will include amenities such as therapeutic pools, two full-size basketball courts, outdoor courtyards, a second-level green roof terrace, updated locker rooms and a video room. Until it is ready, trips like Friday’s will help the team work towards maintaining its home court advantage. Many players are looking forward to the day the new venue’s doors open, which is planned for the fall of 2014. Derrick Rose said having shootaround at the United Center gives them a small taste of what’s to come, including a short commute. 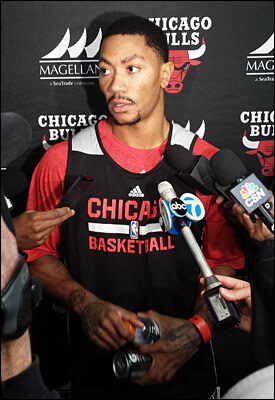 “It’s great, man, I can get here in like five minutes,” said Rose. “So I can’t complain about that and I hope that we continue to do it throughout the year. With Wednesday’s win over Detroit, Rose made his long-awaited return to his home court where he played for the first time in a year and a half. And he didn’t disappoint, scoring 22 points in 22 minutes and fearlessly attacking the basket with his trademark speed and athleticism. On Friday morning, he said he continues to feels fine. When asked if he thinks he’s getting closer to playing at the level he was before the injury, he answered affirmatively. Appearing in three of Chicago’s four preseason games, Rose has averaged a team-leading 16.0 points while adding 2.7 assists, 2.7 rebounds and 1.7 steals in 21.8 minutes. As for facing the Pacers on Friday, while many already call it a rivalry, Rose doesn’t quite feel the same way, at least not at the moment. In 2011, Chicago defeated Indiana 4-1 in the opening round of the NBA Playoffs. Rose explained the difference in his mind between then and now. Rivalry or not, Thibodeau acknowledged that as the Bulls pursue the ultimate goal, the Pacers are one of the teams they’ll have to overcome.